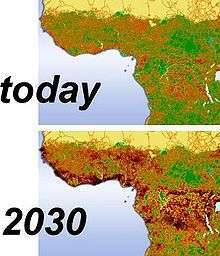 Fragmentation and destruction of Great Ape habitat in Central Africa, from the GLOBIO and GRASP projects. Habitat fragmentation describes the emergence of discontinuities (fragmentation) in an organism's preferred environment (habitat), causing population fragmentation and ecosystem decay. Habitat fragmentation can be caused by geological processes that slowly alter the layout of the physical environment (suspected of being one of the major causes of speciation), or by human activity such as land conversion, which can alter the environment much faster and causes extinctions of many species. Habitat fragmentation is frequently caused by humans when native vegetation is cleared for human activities such as agriculture, rural development, urbanization and the creation of hydroelectric reservoirs. Habitats which were once continuous become divided into separate fragments. After intensive clearing, the separate fragments tend to be very small islands isolated from each other by cropland, pasture, pavement, or even barren land. The latter is often the result of slash and burn farming in tropical forests. In the wheat belt of central western New South Wales, Australia, 90% of the native vegetation has been cleared and over 99% of the tall grass prairie of North America has been cleared, resulting in extreme habitat fragmentation. As the remaining habitat patches are smaller, they tend to support smaller populations of species. Small populations are at an increased risk of a variety of genetic consequences that influence their long-term survival. Remnant populations often contain only a subset of the genetic diversity found in the previously continuous habitat. Processes that act upon underlying genetic diversity such as adaptation have a smaller pool of fitness-maintaining alleles to survive in the face of environmental change. Populations can maintain genetic diversity through migration. In continuous habitats, migrants have few barriers to establish themselves in suitable sites. In fragmented habitats however, the separation between suitable sites disrupts migration, and therefore gene flow, limiting a populations capacity to supplement the reduced genetic diversity of the remnant populations. With lower migration, inbreeding becomes a of increasing concern as the level of homozygosity increases, facilitating the expression of deleterious alleles that reduce the fitness of the population called inbreeding depression. The percentage preservation of contiguous habitats is closely related to both genetic and species biodiversity preservation. Generally a 10% remnant contiguous habitat will result in a 50% biodiversity loss. Area is the primary determinant of the number of species in a fragment  and the relative contributions of demographic and genetic processes to the risk of global population extinction depend on habitat configuration, stochastic environmental variation and species features. Minor fluctuations in climate, resources, or other factors that would be unremarkable and quickly corrected in large populations can be catastrophic in small, isolated populations. Thus fragmentation of habitat is an important cause of species extinction. Population dynamics of subdivided populations tend to vary asynchronously. In an unfragmented landscape a declining population can be "rescued" by immigration from a nearby expanding population. In fragmented landscapes, the distance between fragments may prevent this from happening. Additionally, unoccupied fragments of habitat that are separated from a source of immigrants by some barrier are less likely to be repopulated than adjoining fragments. Even small species such as the Columbia spotted frog are reliant on the rescue effect. Studies showed 25% of juveniles travel a distance over 200m compared to 4% of adults. Of these, 95% remain in their new locale, demonstrating that this journey is necessary for survival. Additionally, habitat fragmentation leads to edge effects. Microclimatic changes in light, temperature and wind can alter the ecology around the fragment, and in the interior and exterior portions of the fragment. Fires become more likely in the area as humidity drops and temperature and wind levels rise. Exotic and pest species may establish themselves easily in such disturbed environments, and the proximity of domestic animals often upsets the natural ecology. Also, habitat along the edge of a fragment has a different climate and favours different species from the interior habitat. Small fragments are therefore unfavourable for species which require interior habitat. Habitat fragmentation is often a cause of species becoming threatened or endangered. The existence of viable habitat is critical to the survival of any species, and in many cases the fragmentation of any remaining habitat can lead to difficult decisions for conservation biologists. Given a limited amount of resources available for conservation is it preferable to protect the existing isolated patches of habitat or to buy back land to get the largest possible continuous piece of land? This ongoing debate is often referred to as SLOSS (Single Large or Several Small). One solution to the problem of habitat fragmentation is to link the fragments by preserving or planting corridors of native vegetation. This has the potential to mitigate the problem of isolation but not the loss of interior habitat. In rare cases a conservation reliant species may gain some measure of disease protection by being distributed in isolated habitats. Wikimedia Commons has media related to Forest fragmentation. ↑ Fahrig, Lenore (November 2003). "Effects of Habitat Fragmentation on Biodiversity". Annual Review of Ecology, Evolution, and Systematics. 34 (1): 487–515. doi:10.1146/annurev.ecolsys.34.011802.132419. ↑ Lienert, Judit (July 2004). "Habitat fragmentation effects on fitness of plant populations – a review". Journal for Nature Conservation. 12 (1): 53–72. doi:10.1016/j.jnc.2003.07.002. ↑ Simberloff, Daniel (1 January 1998). "Small and Declining Populations". Conservation Science and Action. Blackwell Publishing Ltd.: 116–134. doi:10.1002/9781444313499.ch6/summary. ↑ Frankham, Richard; Ballou, Jonathan D.; Briscoe, David A. (2009). Introduction to conservation genetics (2nd ed.). Cambridge: Cambridge University Press. ISBN 9780521702713. 1 2 Rosenzweig, Michael L. (1995). Species diversity in space and time. Cambridge: Cambridge University Press. ↑ Funk W.C.; Greene A.E. ; Corn P.S. ; Allendorf F.W. (2005). "High dispersal in a frog species suggests that it is vulnerable to habitat fragmentation". Biol. Lett. 1 (1): 13–6. doi:10.1098/rsbl.2004.0270. 1 2 Russell, K. N.; Ikerd, H.; Droege, S. (2005-07-01). "The potential conservation value of unmowed powerline strips for native bees". Biological Conservation. 124 (1): 133–148. doi:10.1016/j.biocon.2005.01.022. ↑ Wagner, David L.; Metzler, Kenneth J.; Leicht-Young, Stacey A.; Motzkin, Glenn (2014-09-01). "Vegetation composition along a New England transmission line corridor and its implications for other trophic levels". Forest Ecology and Management. 327: 231–239. doi:10.1016/j.foreco.2014.04.026. ↑ Lampinen, Jussi; Ruokolainen, Kalle; Huhta, Ari-Pekka (2015-11-13). "Urban Power Line Corridors as Novel Habitats for Grassland and Alien Plant Species in South-Western Finland". PLOS ONE. 10 (11): e0142236. doi:10.1371/journal.pone.0142236. ISSN 1932-6203. PMC 4643934 . PMID 26565700. ↑ Bierregaard, Richard (2001). Claude Gascon; Thomas E. Lovejoy; Rita Mesquita, eds. 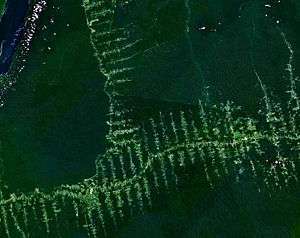 Lessons from Amazonia: The Ecology and Conservation of a Fragmented Forest. ISBN 0-300-08483-8. ↑ Harris, Larry D. (1984). The Fragmented Forest: Island Biogeography Theory and the Preservation of Biotic Diversity. The University of Chicago Press. ISBN 0-226-31763-3. ↑ Banaszak J. (ed.) 2000. Ecology of Forest Islands. Bydgoszcz University Press, Bydgoszcz, Poland, 313 pp. Wikimedia Commons has media related to Ecological fragmentation.